• Thank you to all members! I'm sure many of you, like me, watched the BBC's Blue Planet series last year. This fantastic wildlife documentary highlighted one of the most distressing sights that we have ever witnessed – the impact of plastic on the environment. Since the release of Blue Planet, there have been other documentaries covering the demise of our oceans and ultimately the wildlife and ecosystems that live in them. Single-use plastic has without a doubt become one of the biggest talking points across the globe (maybe behind Brexit!!) and it's great to see global organisation’s like Sky TV forming their own campaigns and keeping it in the media spotlight. But are we just "talking the talk" or are we prepared to "walk the walk"?? Since we started making plastic in the 1950s, we’ve produced about 9 billion tons of it and we’re using more of it than ever. Plastic bottles are the third most common ocean polluter (after cigarettes and food) – 8 million tons of it a year ends up in the oceans. The number of plastic bottles washing up on UK beaches rose by 43% from 2015 to 2016. There are a staggering 35 million plastic bottles sold in Britain every day!! Like many people, I have been guilty of using plastic bottles and throwing them away, naively without thinking of the consequence. However, it hit home to me last year when my son, who was only 3 at the time, filled up his own water bottle one morning to take to pre-school and politely turned around to me and asked if I was filling up my water bottle to take to work! I'm glad to say since then I've got into the habit of doing it not just for work but on a daily basis whenever I'm leaving the house. My son has since started school and everyday children turn up at the gates with their same container in hand. This is great to see and hopefully, the next generation will be more educated and aware of the long-term dangers of single-use plastics, promoting better day to day habits. So, my question to everyone involved with Ferndown golf club - both employees and members - is what can we do to cut down on plastics and ultimately what is our long-term plan? There are some great examples of what golf clubs both in this country and around the world are doing to reduce plastic consumption. Below is a link to Exeter Golf Club with information on the club’s commitment to the environment. I would love to see Ferndown Golf Club lead the way and become recognised locally for undertaking a positive campaign with this sensitive subject. We are holding a fun competition for the girls who have taken part in our Girl’s Golf Rocks programme and welcome any other junior members of Ferndown to take part. 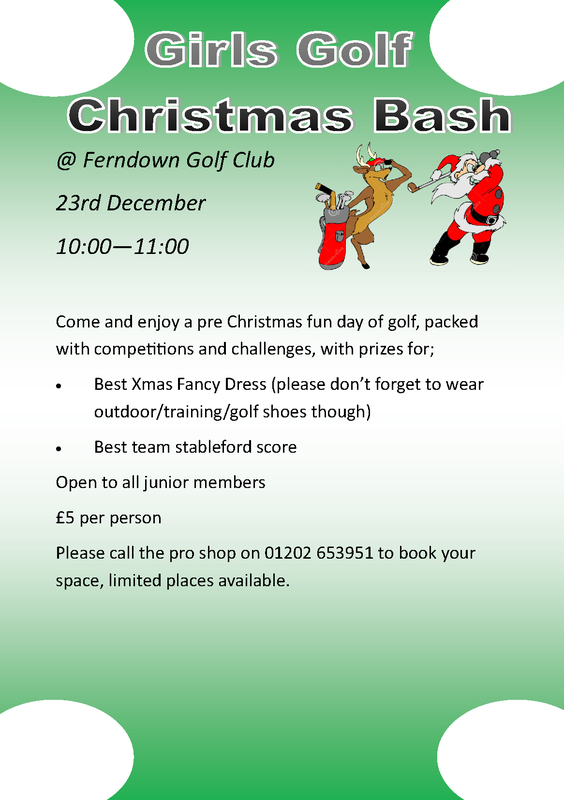 The event will take place on Sunday 23rd December at 10.00 consisting of a 6 hole team event. This will be followed by drinks, snacks and presentation in the Hennessy room. It promises to be great fun - please find attached a poster with more information about the day. On behalf of the Professional Team, I would just like to thank all members of the club for their support during this past year. We are always striving to improve our level of service and value any feedback so please always feel welcome to approach myself or a member of the professional team to do so. Finally, I would like to wish you all a Merry Christmas and a happy new year.